Two people are in hospital after a serious assault in Cornwall. Police and paramedics were called to a house in Robartes Road in St Dennis, near St Austell on Saturday 6 April. When officers arrived they found a man with a knife and used a taser to disarm him. A man in his 60s, was taken to Derriford Hospital with serious injuries, where he remains under police guard. Meanwhile, a woman in her 80s who also has serious injuries, was taken to Derriford Hospital by air ambulance. Officers are not looking for anyone else in connection with their investigation, but are appealing for witnesses. The incident has been referred to the Independent Office of Police Conduct (IOPC) for their consideration. Arthur Northey wants to share his knowledge of the mining industry with the next generation. A student at a secondary school in St Austell has been admitted to hospital with meningitis. The pupil at Penrice Academy is understood to be responding well to treatment. A small number of other pupils - who were in close contact with the youngster - have been offered antibiotics by doctors. A teenage girl is critically ill in hospital after a crash in Cornwall which killed a 20 year-old man. The Warner Bros London 1884 bell was taken from Pine Lodge Gardens in Cornwall overnight on 7-8 November. A motorcyclist has died following a crash in St Austell on Monday 30 October. A 44 year old man was killed instantly after crashing a Yamaha bike just before six thirty at Carn Grey. 15-year-old Morgan Durant was airlifted to hospital with a badly broken leg following the accident at Penrice Academy in St Austell. Elizabeth Martin was walking her pet chihuahua on a lead when they were set upon by a wolf-like dog. Kelly Pearce was a passenger in a car driving on the A390 that left the road and hit 22 parked cars, killing her and injuring the driver. A woman has died following a crash on the A390 at Hewas Water, St Austell, last night. Emergency services were called just after 9.45pm on Sunday 25 June a collision involving a black Vauxhall Vectra Saloon car. As a result the passenger in the car, a woman in her forties, was pronounced dead at the scene. The male driver was taken to Treliske Hospital where he remains with serious injuries. 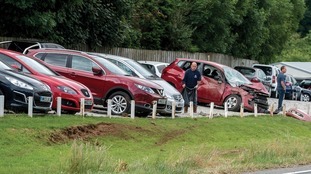 The car was travelling from St Austell towards Truro and left the road before colliding with 22 parked cars parked on the garage forecourt of Andrew Toms Cars. The road was closed for eight hours while officers carried out an examination of the scene. Police are appealing for witnesses and want to speak to anyone who witnessed the manner of driving of a black coloured Vauxhall Vectra in the Hewas Water area that evening or anyone who stopped at the scene.